Join Us!!! We are looking for someone to help us cover Macau basketball. Please send us an e-mail. Uzbekistan celebrated the first win at the 2012 Fiba Asia Cup in Japan. They rolled past Macau in Group A. Aleksandr Kozlov (201-F-82) finished with 24 points and 15 rebounds to lead the winners. Macau fell at 0-2 record after the defeat. Uzbekistan held their opponents to 11 points in the first frame to take a 3-point lead. Macau however surprised Uzbekistan in the second term and earned a 27:26 halftime lead. Uzbekistan made some necessary arrangements during the big break and fired from all guns in the third quarter. They easily cleared off to a 17-point distance before the fourth quarter. Uzbekistan erupted for 29 points in the final term and sealed the victory at the end. Vyacheslav Denisov (195-G-83) delivered 19 points, while Aleksandr Yahin (205-C-89) added 14 points for the winners. Fu In (178-SG-88) answered with 12 points for Macau. Shao Bing Cai (191-PG-92) had 10 points in the loss. The tension was palpable as Singapore Slingers owner Wee Siew Kim called it "the longest 3.7 seconds". His team were holding on to a 80-79 lead and possession after Macau Black Bears played the ball out in the decisive Game 3 of the Asean Basketball League (ABL) play-offs quarter-finals on Sunday (April 7). John Fields (205-F/C-88, college: Tennessee) was then fouled by Black Bears' Ryan Watkins (206-C/F-91, college: Boise St., agency: Two Points) with 2.6 seconds remaining and the Slingers centre made the second free throw to make it 81-79. In a grandstand finish, teammate Jerran Young (198-G-91, college: Wright St.) did just enough to put off Black Bears guard Mikhael McKinney's last-gasp three-point attempt as 1,700 fans at the OCBC Arena celebrated the Slingers' win, which sent them into the ABL semi-finals. They will meet 2016-17 champions Hong Kong Eastern in Game 1 on April 12 (home), Game 2 on April 18 (away), and Game 3 on April 21 (home, if necessary) in a repeat of that season's finals. Slingers coach Beng Siang Neo was not happy with his team's "unacceptable" 19 turnovers, but was relieved they got over the line. He said: "Though we shot badly, the players were determined. They stuck together as a team and did not give up and I'm happy with that." Assistant coach and general manager Michael Johnson added: "It was apt we won with a good piece of defence at the end as we limited a team who averaged more than 100 points per game in regular season." The Slingers got off to a good start and led 26-20 in the first quarter and 44-41 at half-time as Fields impressed with his presence and mid-range shots. The team also did well not to be distracted by Black Bears assistant coach Mathias Fischer's foul-mouthed tirades that went unpunished. With both sides fighting tooth and nail and diving about for precious possession, the scoreline was tight throughout, with neither team holding a double-digit lead. However, things went awry for the hosts in the third quarter as guard Young picked up his fourth personal foul early on and had to be benched as the Black Bears thrived on triples and led 60-59 going into the final period. Neo went for broke as he re-introduced Young, only for Watkins to injure Fields' nose and cause the centre to miss one minute of play. Nerves also set in, as Fields committed an inbound infringement and an unnecessary foul, while the visitors had two shot-clock violations. Fortunately, in the nail-biting finale, Young stepped up with nine points in the last 10 minutes, and Fields returned to finish strong with 23 points and 14 rebounds. Fellow American import Xavier Alexander (198-G-88, college: S.Nazarene) was also key with 24 points, before fouling out with 1min 39sec left. Among the locals, power forward Delvin Goh had nine points and nine rebounds and guard Ng Han Bin chipped in with seven points. The attention now shifts to the best-of-three semi-finals against Eastern, who swept the Slingers 2-0 in regular season and beat them 3-1 in the 2016-17 finals. Alexander said: "We just need to keep getting better. Don't turn over the ball, keep running the floor and playing to our strengths. "I'm definitely confident of making it to the finals. It's been my goal for the last four years and it's still my goal now." Wee hailed the home fans for their vociferous support and said: "Ticket sales started only on Friday and we managed to get about 1,700 fans. They were on their feet and we really felt them behind our team today. We cannot do without them. "I have the belief and confidence that as our local and import players mature together, we can go all the way." The Macau Black Bears banked on a late rally to defend homecourt and defeat the Saigon Heat 97-95 in ASEAN Basketball League action. Inside the Nanhai Gymnasium, the Black Bears had to rally back from a nine point deficit at the start of the fourth quarter. A triple by Murphy Burnatowski (196-PF-91, college: Colgate) to start the period gave the Heat the 80-71 advantage, however that was quickly countered by a three from Anthony Tucker as well. Both teams would exchange field goals, however the Black Bears would have the better finishing kick. A layup from Ryan Watkins (206-C/F-91, college: Boise St., agency: Two Points) at the 6:35 mark kicked off a 11-2 run that gave Macau the lead, 92-90 with 2:26 remaining in the game. Burnatowski would make two straight baskets to tie the game at 92-all with 1:50 remaining, but a triple from Nathan Yu (189-PG-89) and a shot in the paint from Watkins restored the lead to the Black Bears, as they held on to the victory. Macau was led by a pair of terrific performances from Tucker and Mikh McKinney (184-G-92, college: Sacramento St.). The reigning World MVP Tucker had a double-double of 26 points and 14 assists, while Mikh McKinney had a team-high 27 points, 4 rebounds and 3 assists. The Heat played their first game of the season without World Import Trevon Hughes, who went down with a leg injury in the second quarter of the loss to the Formosa Dreamers. Murphy Burnatowski tallied 29 points, 12 rebounds and 9 assists to pace the Heat. Kyle Barone (203-C-89, college: Idaho) dropped 25 points and 9 rebounds. The Heat got solid performances from their locals in Tanh Sang Dinh and Chris Dierker, who had 18 and 15 points respectively. But with Young on the sidelines, the team's rotation had to adjust. As a result the Heat got zero bench points, and only one player actually came off the pine to relieve the starters in Chris Cilia. Fatigue could have been a reason for the loss, as no starter played less than 35 minutes in the game. The Black Bears climbed to 5 wins and 2 losses in 3rd place in the standings, while the Heat lost its second straight game to fall to 3-2 in fourth place. The Black Bears will now embark on a long break before their next game, which is scheduled for January 9, 2019 against the Formosa Dreamers. The Heat will look to bounce back and arrest their skid against the Westports Malaysia Dragons on December 9 at the CIS Arena. At 5-0, with another opponent/victory waiting in the wings, the Guam Men's National Basketball Team has already made history. The team entered the FIBA Asia Cup 2021 Eastern Region Pre-Qualifier as an unranked, unknown team from a global perspective. It buried Macau 97-64 on Friday. If they complete the tournament sweep and go 6-0 with a victory over Malaysia late Saturday, they will be the talk of the Asia Cup. Guam already owns one of the four slots that were available to advance to the next round of competition, with convincing wins against the other three countries that earned invites. Guam, Malaysia, Indonesia and Thailand are half of the best Division B teams to enter the tournament. They will play against some of the best A Division teams. The field will be further culled into the best teams from each of six pools, and each pool will battle over the next two years to see who makes it to the top four, and finally, the 2021 Asia Cup itself. Guam is winning with a diverse team of professional ballers and Guam-grown talent. Earnest Ross (196-G-91, college: Missouri, agency: Haylett Sports), Guam's top scorer, was born on Guam in 1991 and turned pro in 2014. The Wesley brothers - Mekeli, Tai and Russ - lived on Guam for several years during their middle and elementary school days and the eldest, Mekeli, was classmates with former Guam National Team players such as Mike Lee. Curtis Washington spent his teen years on Guam and played for the Guam High School Panthers as a self-proclaimed string bean at 6-foot-5, 170 pounds. He's now a 6-foot-10, 230 pound monster in the paint. Daren Hechanova spent years in the states, but he is as CHamoru as can be. Watch any of them play. Listen to them among the rest of the team; listen to how they talk when they are on Guam. They are all down for Guam, as if they were born and raised here. With Guam grown talent such as Willie Stinnett, JP Cruz, Earvin Jose, Chris Conner, AJ Carlos and Billy Belger, this team has proven itself unstoppable in Oceania's East Region. A team this good may never be assembled by the island again. But given coach E.J. Calvo's efforts to unite this squad - a far-reaching effort spanning several years - don't rule anything out. "Even without some key players that are already known - yes, I would say that this is the best team to put on a Guam jersey," said Calvo. When the tournament is over, it's unlikely this squad will be seen on the same court, or even on the same continent. 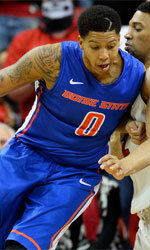 Tai Wesley (201-F-86, college: Utah St.) is in the middle of his professional season playing for New Zealand. Russ Wesley goes back to school to become an NBA referee in Utah. And Washington heads home to Atlanta to decide where he'll ply his talents next. At the final practice before leaving to Thailand, Washington shared: "It's awesome to get to come back to your island, represent your country, travel and play other countries ... it's really a blessing," said Washington. "I've played against Tai and Earnest in other professional leagues, and we all know what we can do. I feel like we are gonna be unstoppable. The pieces have come together and the defenses are going to have to pick their poisons." Calvo, now the president of the Guam Basketball Confederation, will eventually hand the coaching reins to someone else. He'll see out the same opportunities for Guam's women and youth. If there's a 6-foot-6 CHamoru female guard out there, Calvo will find her and recruit her. For now, he and his coaching staff of Jine Han and Danny Payumo can bask in the success of a team that has truly been years in the making. This squad earned its spot in Guam's basketball archives and already has changed the course of Guam basketball forever. As for Calvo? He's already making recruiting calls. Go figure.